SHANGHAI (Reuters) -- Volkswagen Group will launch a VW-badged luxury sedan designed solely for China next year to help boost its margins, said two people with knowledge of the plan. The move, however, could put VW brand in direct competition with its premium sibling, Audi. The car will be based on Audi's A6, the country's top-selling luxury sedan, the people said, declining to elaborate on the vehicle's China-specific elements. The price of the VW premium sedan is undetermined, and nearing the A6's 383,000 yuan ($62,375) starting price would risk cannibalizing Audi sales. But Volkswagen, better known for small cars and family-oriented models, is drawn to Audi's margins. VW brand sells three times more cars than Audi globally, yet Audi earns more than double the profit. "Volkswagen wants to boost its brand value, which is natural for any company seeking higher margins. But it's not easy," said Yale Zhang, managing director at consultancy Automotive Foresight. "If Volkswagen's premium car is priced too high, people would go straight to Audi. If the price is not high, then what's the point?" Volkswagen aims to replicate Audi's success in luxury vehicles at a time when a state crackdown on extravagance among public officials is creating demand for upmarket cars absent of marques typically associated with opulence. Going upmarket would see the German automaker trespass into a segment dominated by Audi, BMW and Daimler AG's Mercedes-Benz, which are in turn seeking growth by producing more affordable models closer to Volkswagen's lineup. "Selling luxury cars makes for fatter profit. Volkswagen believes this segment will continue to grow rapidly," said one of the people, who is not authorized to talk to the media so declined to be identified. "Premium models under the Volkswagen brand will be especially attractive to those who want a superior car but don't want to catch too much attention," said the person, dismissing the long-term impact of the crackdown. China's premium car market could surpass that of the U.S to become the world's biggest as early as 2016 because of increasing affluence, consultancy McKinsey & Co. estimates. The VW Group operates upper-class brands Audi, Bentley, Porsche and Lamborghini independently to its VW brand. The group commands over one-fifth of China's passenger vehicle market where it dominates in mid-tier compact sedans. Volkswagen's new premium car is code-named 511, the people said. 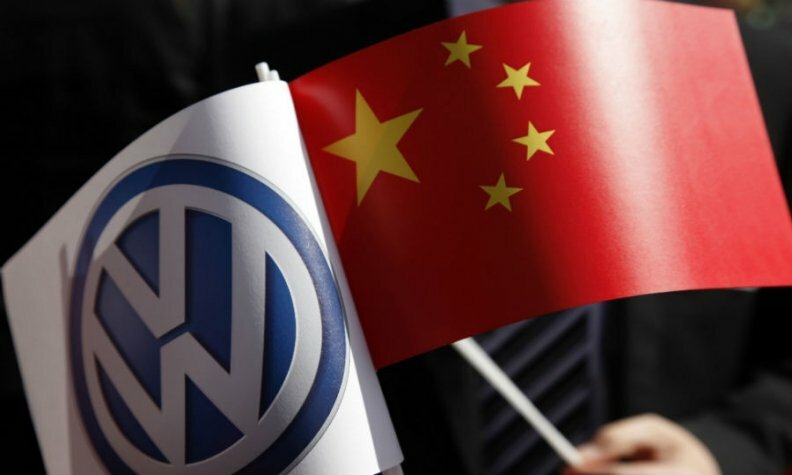 It was designed in Europe but will be the brand's first large sedan manufactured in China by Shanghai Volkswagen, a joint venture with China's SAIC Motor Corp.
A spokeswoman at Volkswagen in China confirmed the existence of a plan for the large sedan but declined to provide details. SAIC Motor declined to comment. Shanghai VW produces the Santana, China's No. 2-selling compact sedan this year, according to researcher LMC Automotive. But the German automaker's joint venture with China's FAW Group, FAW-Volkswagen Automobile, is more profitable because it builds Audi cars, one of the people said. Volkswagen earned 1.01 billion euros ($1.29 billion) in operating profit in January-June selling 2.3 million VW passenger vehicles globally. By comparison, Audi earned 2.67 billion euros from 750,000 cars. Volkswagen's entry into China's high-end car market will begin toward the end of 2015. The annual sales target of 50,000 vehicles, the person said. To elevate its brand image, Shanghai VW will set up 100 upscale dealerships across China over the next three years.